Rep. Ryan Costello (R-6) Thursday announced the Pennsylvania Department of Conservation and Natural Resources has received an award in the amount of $2,420,000 for land acquisition in the Schuylkill Highlands Project Area. The grant is through the federal Highlands Conservation Act. 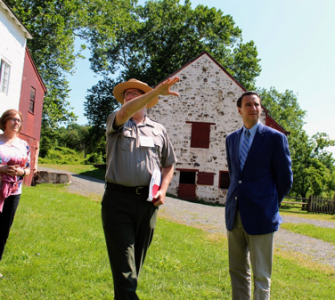 As co-chair of the Land Conservation Caucus in Congress, Costello notes that he has been a strong supporter of the Pennsylvania Highlands, which includes portions of Valley Forge National Historic Park, the Schuylkill River Heritage Area, and Hopewell Furnace National Historic Site in Pennsylvania’s Sixth Congressional District. As a former Chester County Commissioner, Costello led efforts to preserve Chester County’s historic farmlands and open spaces, and in Congress, Costello has been an outspoken advocate for long-term land conservation funding for the Pennsylvania Highlands Region that runs through the Sixth District. In particular, as a cosponsor of legislation that would extend Highlands Conservation Act funding through 2021, Costello said he was pleased to announce the grant. In Congress, Costello has supported full funding of the Land and Water Conservation Fund (LWCF) and helped introduce the Delaware River Basin Conservation Act (DRBCA), which was signed into law late last year.